Whether we are trying to impress a date after an art house film screening or discussing Oscar nominations among friends, we all need ways to look at and talk about movies. But with so much variety between an Alfred Hitchcock thriller and a Nora Ephron romantic comedy, how can everyday viewers determine what makes a good movie? In Talking Pictures, veteran film critic Ann Hornaday walks us through the production of a typical movie--from script and casting to final sound edit--and explains how to evaluate each piece of the process. How do we know if a film has been well-written, above and beyond snappy dialogue? What constitutes a great screen performance? What goes into praiseworthy cinematography, editing, and sound design? And what does a director really do? In a new epilogue, Hornaday addresses important questions of representation in film and the industry and how this can, and should, effect a movie-watching experience. Full of engaging anecdotes and interviews with actors and filmmakers, Talking Pictures will help us see movies in a whole new light--not just as fans, but as film critics in our own right. "[An] illuminating new book for anyone who wants more from the movies than popcorn and thrills." 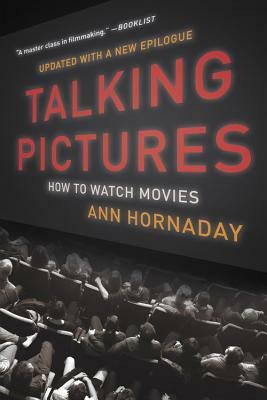 "Ann Hornaday provides a pleasantly calm, eminently sensible, down-the-middle primer for the movie lover--amateur, professional or Twitter centric orator--who would like to acquire and sharpen basic viewing skills." "In this essential book Ann Hornaday explores the unique alchemy of filmmaking through its various disciplines, and manages to explain the unexplainable. With clarity and compassion she demystifies the brilliance of Groundhog Day, breaks down how the editor on a film is the audience's chief surrogate, and ultimately puts her finger on what we crave every time the lights go down in a movie theater: 'the singular joy that comes from authentic human connection.' This book is a true gift to all filmmakers and film lovers."